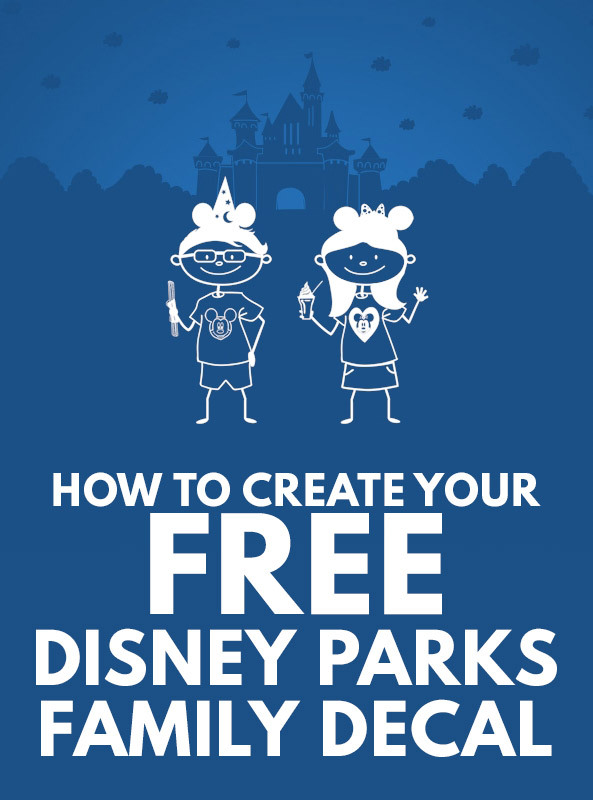 We at Guide2WDW are all about great Disney freebies and ways to bring the magic home. Disney has a new way for you to proudly display your family’s love for Disney World and Disneyland, as well as get excited for your next trip to Orlando or Anaheim. 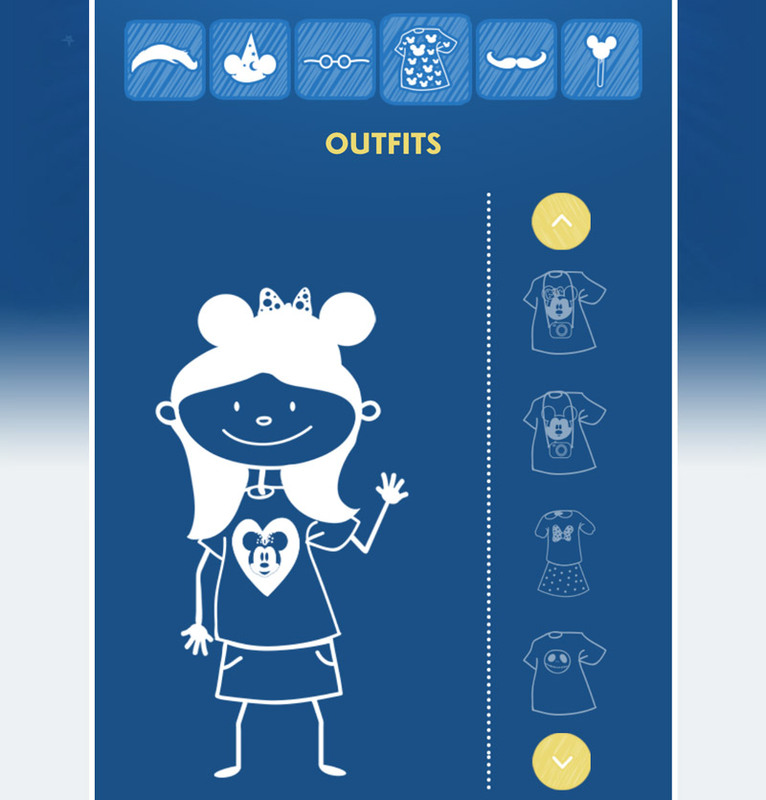 With Disney’s online tool, you can create a completely customizable stick figure decal that depicts every member in your family showing off their Disney side, including pets. 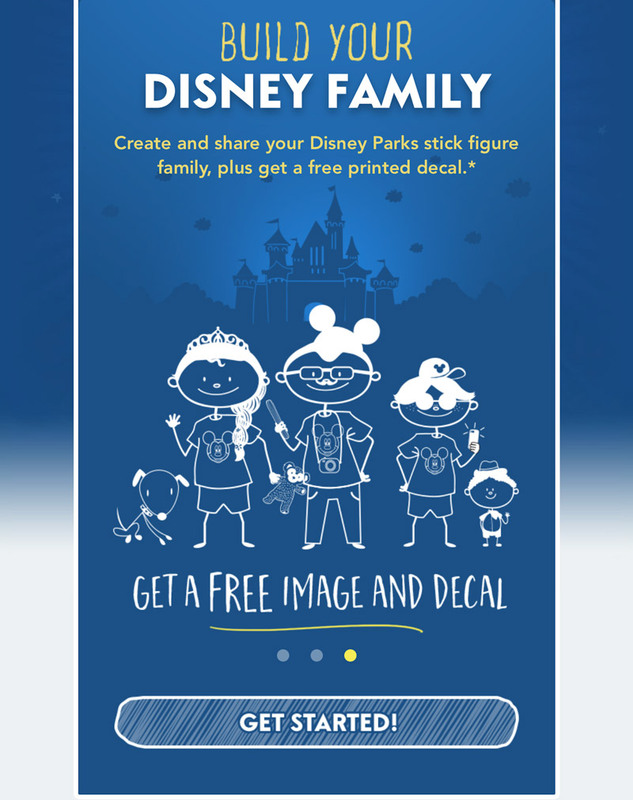 Anyone can create a fun stick figure portrait of their family and download the image to share on social media, and if you’re a US resident, you can actually get Disney to send your customized decal in the mail for free. Click here to get started, or read on to find out more. Once you’ve clicked the graphic, you can begin by creating a stick figure for each member of your family. Whoever you create first will go on the leftmost side of the decal. You can select their age from adult, teen, kid, and toddler – basically how tall the stick figure will appear. Note: Toddler has much fewer customizable options. You can also include a dog or a cat in the portrait. You then create the person’s look, choosing from hair, clothes, and accessories options. 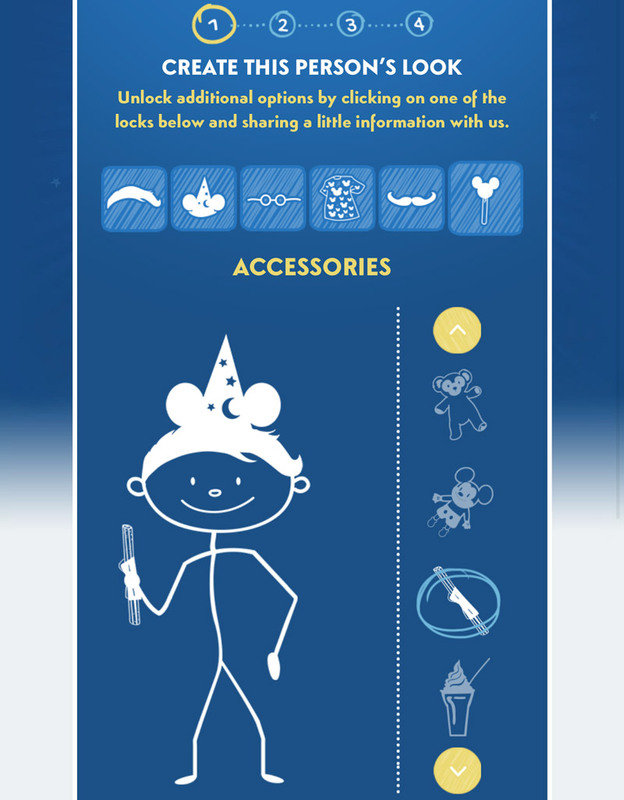 Of course, this is a Disney stick figure you’re making, so you can choose anything from having your character hold a Dole Whip and wear Hollywood Tower Hotel shirt to having your character chow on a churro while donning some Mickey Ears. There are actually an impressive number of options to choose from, so you can definitely show off what each member of your family loves about Disneyland or Disney World. After you’ve created a stick figure for each member of your family, you can give a caption to your family portrait. 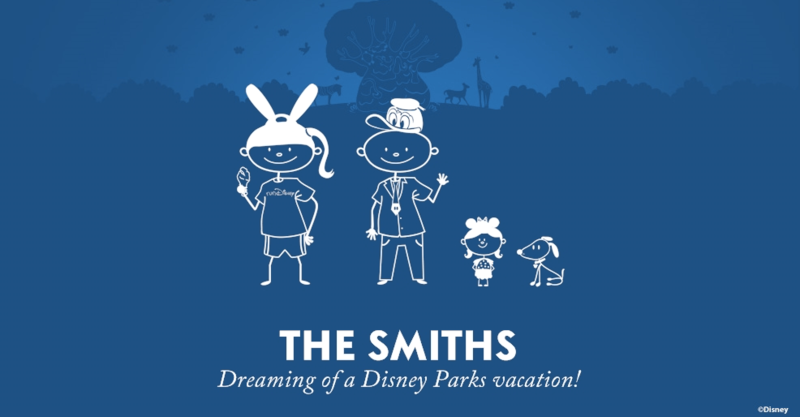 They suggest something like “The Smiths” or “The Smith Family,” but you can get creative if you’d like. 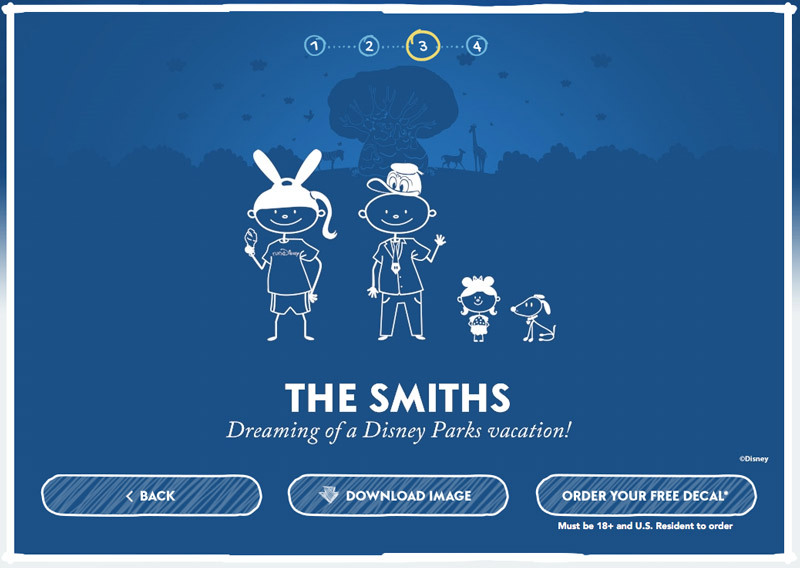 You can also choose a tagline like “Dreaming of a Disney Parks Vacation,” and select which backdrop you would like for your decal. The options are the 6 Disney Parks in the United States: Disneyland, California Adventure, Magic Kingdom, Epcot, Hollywood Studios, and Animal Kingdom. 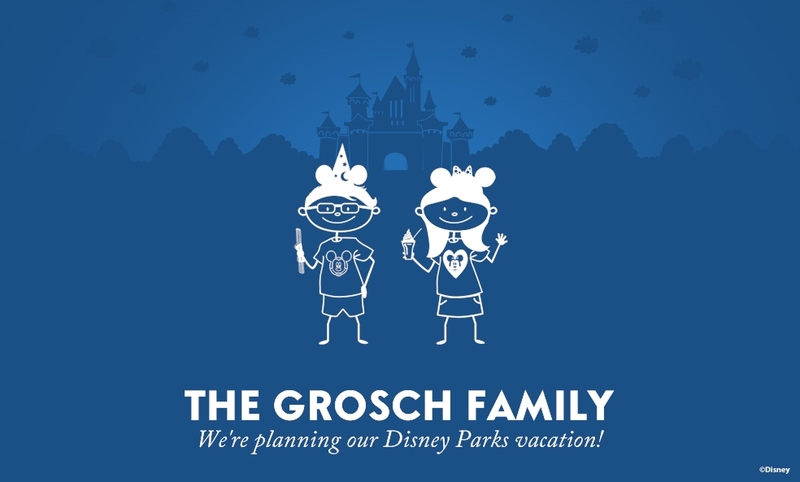 So you could make a decal for each member of your family showing off their favorite park! Here’s a decal I made of my fiancee and I at Disneyland. Once you have completed all these steps, you’ll be able to download your image and share your creation on social media. For US Residents, be sure to click the button to order your decal. You’ll have to provide a mailing address, as well as your birthday (to prove you’re over 18) and email. ← Eventology – The new trivia game from the makers of Guide2WDW that Disney fans will love!